Use the Templates preference panel to manipulate any of the common templates predefined within CDT or create your own. To modify, delete, export, import, or create your own templates click Window > Preferences > C/C++ > Templates. New... Opens the New Template dialog to create a new template. Edit... 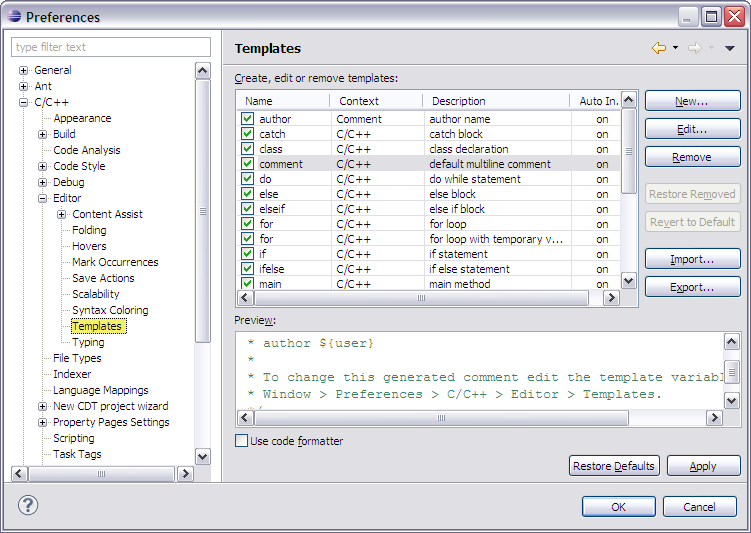 Opens the Edit Template dialog to edit the selected template. Remove Removes the selected templates from the list. Restore Removed Restores templates deleted by the last Remove action. Revert to Default Removes the last edits made to the selected template restoring it to it's unmodified state. Export... Exports the selected templates. Use code formatter Enable to apply the currently selected code style to the template.